REMEMBERING A LOVED DOG or FRIEND OF THE PARK? Do you have a loyal canine companion or a friend of the park who is no longer with us that you would like to honour with a permanent remembrance? 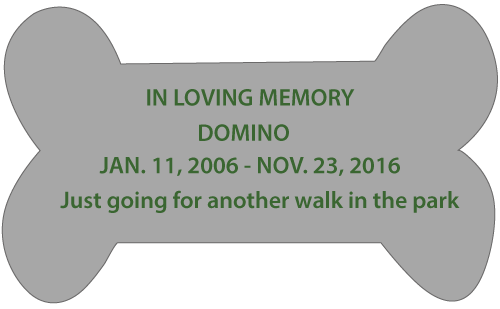 ODAWG is pleased to announce that Memorial Plaques are now available for order at a cost of $50 per plaque which includes the lettering. The 5” x 3” bone shaped plaques are professionally designed, soft grey Corian tiles and will have your personalized message in green text, in a design similar (but not identical) to the illustrations. Messages may include up to 4 lines of text. Each line may have a maximum of 40 characters including spaces and punctuation. The bones will be mounted on the Memorial Bench in the big field at the off leash park. The Memorial Bench was originally designed by Gregory Allan Designs and constructed with help from Matthews Equipment and volunteers. 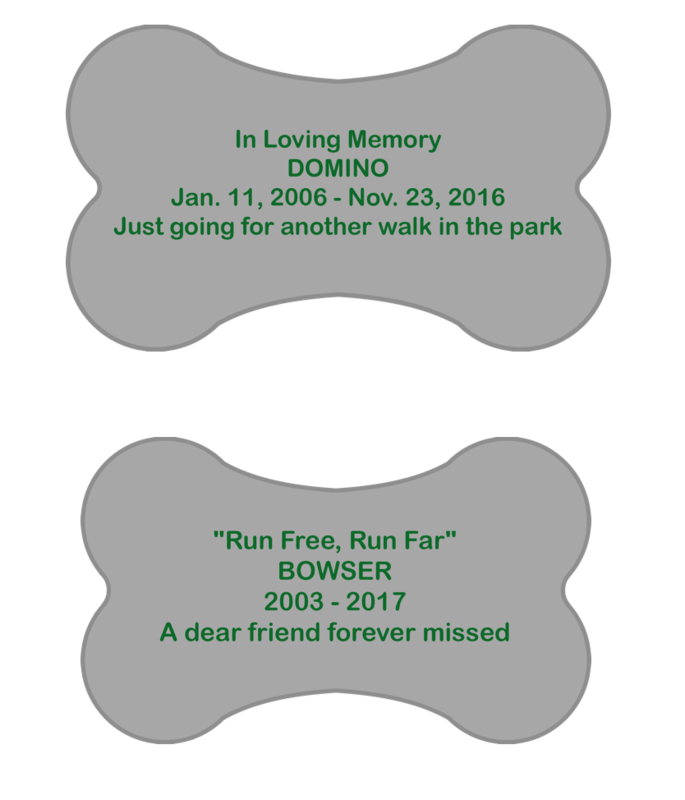 If you would like to purchase one of these bones, please complete the Memorial Plaque Order form online or print and submit it to Debi@harmonydogpark.ca . Please note that full payment must be received by ODAWG before the order can be submitted.